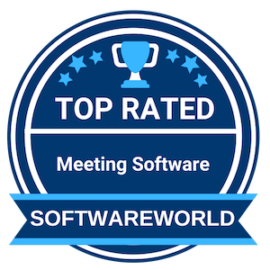 Do you know about the best Meeting software of 2018? While no one denies that face to face meeting has its own benefits but sometimes it cannot be practical. And one thing all should remember is excellent communication is the key to the long-time survival of all business. Online meeting software is a tool used for conducting meetings on the internet. This software helps you to save time as well cost. It is not compulsory that all the employees should gather in one place to attend this meeting. It helps in transfer of information quickly no matter the recipient is how far away. This virtual meeting software can be installed on your smartphone, computer or laptop. So you can easily attend the meeting comfortably and at your convenience. You may find a lot of free meeting management software or cloud software needed for the business. Each comes with some uniqueness and may have a different feature that makes it apart from others. Below we have brought the 10+ best meeting software for all types of businesses. We have gathered this list from the reviews and ratings listed on websites such as GetApp, Capterra, and G2Crowd. What are the Best Meeting Software in 2019? About GoToMeeting : GoTo Meeting is one of the simplest and most sophisticated meeting software applications which provide you a professional platform at an affordable budget. The application is a unique virtual meeting room which allows you to leave a professional impression on your business counterparts without having to meet them in person. This online meeting app not only saves a lot of time but is highly cost-effective when you want to connect with people and collaborate with business meetings. About TeamViewer : TeamViewer is leading all-in-one best meeting software that has established new standards for remote connectivity solutions. TeamViewer is a platform that has utilized the latest technologies by embedding innovative ideas and paving a secured path towards the global network. The app is fast, secure, and supportive with augmented reality. TeamViewer offers remote desktop access, and screen sharing with both iOS and Android devices. The app is an ideal platform to support employees form large organizations in handling business meetings. “What I like about TeamViewer is the great speed it has when making the remote access connection, the quality of the video it has is quite interesting and has a nice color quality that greatly improves the customer’s view, speed with which the shared video works, it is quite good ” – Edward M.
About Cvent : Cvent is the table turner for event planners and business professionals who want to hold meetings. Cvent is one of the best meeting software as it is easy to use, simple to integrate and has powerful online customer support. The software has been one of the highest rated meeting software because of its strategic features and advanced technologies. The software helps organizations to plan and host market events, engage audiences, execute on sites and analyze reports. Cvent ensures success by delivering unique diagramming and seating solutions for event planners. “Cvent has improved our event participants’ experience during registration, with admin and group registration and automatic confirmation, receipt and invoice emails. Our team spends less time updating and monitoring registration. Parked reports allow our partners to check in anytime they’d like. ” – Laura H.
About Samepage : SamePage is unique best meeting software that aims at getting things done in a better way without engaging more apps. With the help of this simple meeting software, companies can hold team chats, collaborative meetings, video conferencing, file sharing, task management, and other interactive summits. SamePage aims at offering an organized space for the team to work without wasting time, money, and energy on installing different apps for various tasks. About ReadyTalk : ReadyTalk is a full stack meeting software that offers a unique platform to host webinars, meetings, webcasts, and presentation without being physically present at the venue. ReadyTalk is one of the unique collaborative platforms that any big or small organization can ask for. The array of services offered by this software are exclusive and in high-capacity. Whether you want to hold business meetings, web or audio presentation or live-content streaming; ReadyTalk does it all. “I like the constant advancing of this software. One, the vendor introduces new features everytime, which continues to improve the communication process in our firm. Besides, the application is so easy to use, with all the necessary specs to solve the challenges of an organization. Lastly, ReadyTalk is very affordable.” – Kelly M.
About BoardPAC : BoardPAC is meeting software that acknowledges the need for confidentiality and security of business meetings. The software has been acclaimed as one of the best meeting software in 2019, the reason being its high standards security feature and user-friendly functionalities. BoradPAC works best on iOS and Android devices with cross-platform support. The software is backed by powerful online customer support and advanced technologies to meet the current market trends. “Our board and committee comprise of a combination of both young and senior members, I am impressed how BoardPAC is designed in a manner to cater to both the users. It has a on click meeting dashboard which helps members to easily navigate to find the relevant meetings and circular resolutions. ” – Yasmin G.
About Diligent Boards : Impactful collaborative software is important to lead your organization towards success. Diligent Boards is one of the best meeting software that manages to deliver a centralized platform to hold Governance meetings, board meetings, webinars secure messaging tools, entity management, board assessment tools, and many other such functionalities. Diligent Boards is cloud support enterprise governance software that adds value to the full scape governance responsibilities of an enterprise. “It allows me a safe and transparent communication, it automatically saves me important messages. I can create conversation groups, share documents and files in meetings in a secure way. It’s excellent. Messenger is an amazing work tool very easy to use. It is reliable.” – Madeleyne M.
About 24sessions : 24sessions is a unique meeting software that understands the importance of customer interactions in order to figure out grievance and promote new products. 24sessions allows business institutions like insurance companies and product manufacturers to have live video calls with customers and have an interactive chat with them. The software also offers feedback sessions after every meeting along with recorded chat for training and compliance purpose. 24sessions offers a highly reliable platform for a live chat that includes sharing screen time on mobile and file-sharing as well. About Boardable : Boardable is outstanding meeting software that empowers you to manage board meetings more effectively with the help of advanced tools. Boradbale assists you in centralizing all communication between you and board members and securely store files and documents related to the meetings. Boardable comes at affordable pricing and manages to establish a safe and secure environment for board meetings. The software also offers inbuilt templates to manage Dynamic agendas and streamline integration with Google Sheets. “I love how easy it is to keep my core members informed. I also love that I can segment them based on committee’s or initiatives to keep the ‘lines clear’ on only information pertinant to what they’re involved in. The most impactful thing this software has allowed me to do is mobilize my board members..” – Danielle S.
About Azeus Convene : Azeus Convene is a smart, simple and one of the best meeting software that helps in managing board meetings smoothly. The software is award-winning, leading meeting software that has been acclaimed by directors and executive professionals around the globe. The software is specially designed to meet the requirements of pre-meeting preparations and post-meeting document sharing process. With Convene, it has become easy to hold remote meetings as well. “Azeus Convene has the possibility to prepare meetings anywhere and offline. It has a system to protect all your information and data so you don’t need to worry. The software also notifies all group participants of updates about meetings and other events. The best meeting and business software.” – Richard P.
About Vectera : Establishing effective online conversations with business clients is important for a successful enterprise. Vectera is one of the best meeting software that helps in scheduling, meeting, and repeating the process with clients in a smooth way. Vectera gives a fast start to video meetings without involving in any installation process. The software streamlines the conversation and allows you to pick up the conversation from previous meetings. The software is one of the best in holding whiteboard meetings, co-browsing and documentation. “Great software, it works perfectly and it fulfills a real business need for our company. Next to that I have to say that they have a hands on support team who are really quick in helping you out. Be it a technical (hardware) issue or a bug in the UI, they listen and are available. Great app/tool, I love it!” – Maxime V.
About eyeson : Eyeson is a unique platform that allows hurdle free video conferencing and meetings. Eyeson is built with patented technology that is designed to use low data consumption. The software guarantees flawless video chat and calls in one app, thus saving energy, time, and money invested in installing multiple apps. Eyeson allows the user to connect up to 9 people and enjoy high-quality video calls. The app is easily available on play stores and app stores to connect with your friends and families. “It’s just one click and you are ready to roll. That’s really convenient! eyeson is nowadays really the tool I choose to use for video conferencing! Really fast video conferencing. Probably the easiest and fastest way to hop onto a video conference.” – Thomas K.